The sixth season of Adventure Time brought a lot of the mysteries that had been building up from the start to the fore, and answered a few of the show’s big questions. Unfortunately, when actually brought into the foreground, some of the answers we were given ended up much less exciting than the open possibilities we had before. Not only that, but a slew of throwaway or dull episodes, a strange release schedule that meant this season aired over the course of more than a year, and severe disappointment over guest animators means that this was where Adventure Time lost me. I still watched the season, at a considerable delay, and I will still at some point watch the next. But I no longer feel particularly excited about new episodes or watch them quickly. I can catch up later. Having watched since Adventure Time was but a silly, random pilot episode where it felt like anything could happen, this is a little sad for me. Season 6 had some great ideas. The Lich was transformed into a giant baby, and a highlight came when Lumpy Space Princess did a very bad job caring for him. Finn gets an arm cut off and goes through a series of replacement limbs, though nothing much came of them. The latter half of the season constantly foreshadowed significant events coming with the approach of a ‘Catalyst Comet’, with a good sense of continuity and build-up. 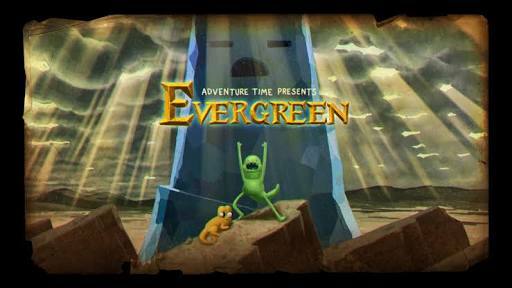 There was a very interesting flashback episode to long before the start of the series, with Evergreen. And Finn finally met his father, Martin. But none of these satisfied very much. The Lich turning into Sweet Pea and the backstory introduced in ‘Evergreen’ both held my attention well, but what they set up has yet to develop into anything important, which is also the case for the reappearance of Simon’s wife Betty. The idea of Finn’s dad not being a hero or positive role model but an opportunist with a tendency to abandon those who bond with him is refreshing and quite clever, but makes episodes centred on him a bore. The appearance of the comet was built up well, but especially compared with the Lich in the last season was dealt with far too quickly and the random ways Finn could deal with everything he faced were deeply artificial. I enjoyed the increased development of minor characters like The Cosmic Owl, Peppermint Butler and Jake’s family (both his kids and his brother), but at this stage I’m a little bored of Lemongrab, the King of Ooo and Magic Man – even if the latter is in a more interesting position now. Susan Strong is a character who probably didn’t need to recur, and the classic characters like The Ice King and Lumpy Space Princess felt under-used towards the end of the season. I really, really hope we never see Chips and Ice Cream or the Ghost Fly again. Then we come to the guest animation. I was very excited to hear that Yuasa Masaaki was going to do a guest episode. Kaiba remains one of my favourite anime series of all time, and he did such a superb guest episode for Wakfu. But even though it was critically lauded, I thought ‘Food chain’ was a mess. Yes, it was experimental, to a degree, but mostly it felt bereft of new ideas, any actual sense of the established feeling of Adventure Time or any of the emotional sincerity that distinguishes his other work. For me, this was a huge disappointment. I had no expectations of David Ferguson, but ‘Water Park Prank’ was, for me, the worst episode of Adventure Time yet and I very much doubt it will be topped. The awful ugly art style I could deal with, but the horrible pacing and story of the episode, which again seemed like there was little or no familiarity with what has been established as the Adventure Time world made me feel a faint sense of second-hand embarrassment throughout. Still, the season was by no means disastrous. I just feel increasingly less intrigued as the show’s mysteries are answered, and feel that there’s a pressing need for the show to establish a kind of end goal for Finn to strive towards, now. Because at this stage it feels like aimless drifting. And we know how stoners can get way too stuck doing that.